Cathy Schnaubelt Rogers, Founder, Aero Tech Designs Cyclewear, fell in love with cycling at age 12, where she attended a girl scout camp with her spider bike. From this humble beginning, she has ridden all over the world. Cathy has bicycle toured self contained with panniers across the United States riding from Tampa, Florida up the east coast to Cape Cod, Massachusetts. She also has bicycle toured through eight European countries. The most she ever rode in one day is 140 miles! Cathy is an avid cyclist who, with her husband recently rode across the United States from Washington state to Washington DC. She is a former USCF licensed bike racer, who cycled for the University of South Florida in many sanctioned races. In addition, she was a competitive triathlete. Cathy continues to ride in bicycle tours and organized bicycle events. Ms. Rogers describes her fascination with the bicycle as a form of neurosis or disease that she can’t shake off. She collects bike art and describes her home as a shrine to the bicycle. She says: “Riding my bicycle makes me happy” which is the essence of her love affair with the bicycle. Check out the FitLabPGH Podcast episode featuring Rick Holzworth, released 8/5/18. 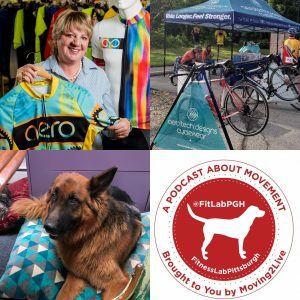 Check out the FitLabPGH Podcast episode featuring Bill Orr of the Montour Trail Council, released 1/28/17. Check out our sister podcast Moving2Live concise but interesting podcasts for the movement and exercise professional and amateur aficionado.